The Two Questions with… blog tour has returned!! This week I am very happy to host my friend K. Bird Lincoln on the first round of the “Two Questions With (The Romance Edition)…” blog tour. Huge thanks for taking the time to participate. I’m really glad you came along for the ride. Here are K. Bird Lincoln’s Two Questions!! What is your favorite romance trope to read; frenemies-to-lovers, second-chance romance, fake marriage, or forbidden love? Forbidden love! Ah how an adolescent Kirsten yearned to be like Lady Chatterley’s Lover or to experience the party scene in Romeo & Juliet. The thrill of risking everything, sticking it to society, throwing all caution to the wind, and just leaping off a cliff of love was the best. I think movies like Twilight (what’s more forbidden than a vampire?) or my favorite Urban Fantasy series like the first 7 books of Laurel K. Hamilton’s Anita Blake or all of Charline Harris’ Sookie Stackhouse series drill down deep into the adolescent heart and pluck all the right strings of wanting acceptance while aching for uniqueness. That’s before I met Mr. Darcy, of course. (I’ll take either Colin Firth or Matthew McFadyen, thank you very much). The thrill of giving the finger to society’s mores paled in comparison to a person fighting their very own inclinations and tastes, unable to stop circling back to the very person that irritates and fascinates them the most! And as I matured, the more mature heroines, the sadder-but-wiser folks, attracted me. I got into Sherry Thomas’ My Beautiful Enemy and then Joanna Bourne’s The Spymaster’s Lady…..and I was hooked forever. (I recommend Spymaster’s Lady to all my romance reader friends…it’s got an unbelievable beginning as well as two main characters with excellent agency and all the reasons in the world not to fall in love). So I’m a die-hard frenemies-to-lovers fan now. Bring on Benedick and Beatrice! And all their delicious banter. I fall hard for good banter and frenemies-to-lovers has the best banter of all. 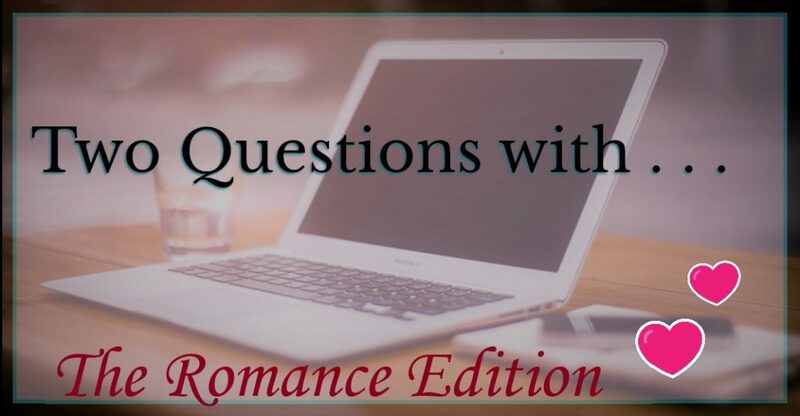 Do you include some type of romance arc in your SF/Thriller/High Fantasy? Why yes, I do, funny you should ask. Despite my whole-hearted love of frenemies-to-lovers, weirdly enough that is not the main romance trope in my Urban Fantasy or Historical Fantasy. Tiger Lily, medieval Japanese fantasy about a peasant girl who can hear outlawed gods sing, is all about the forbidden love. The main arc is about her helping her Lord defeat a pretender Emperor, but the shadow main arc is about a girl who defies society’s stereotypes in order to find love acceptance with the arms of someone who should never notice her in the first place. No vampires, I promise, but Lily is definitely the heroine of my adolescent fascination with love despite society’s regulations. 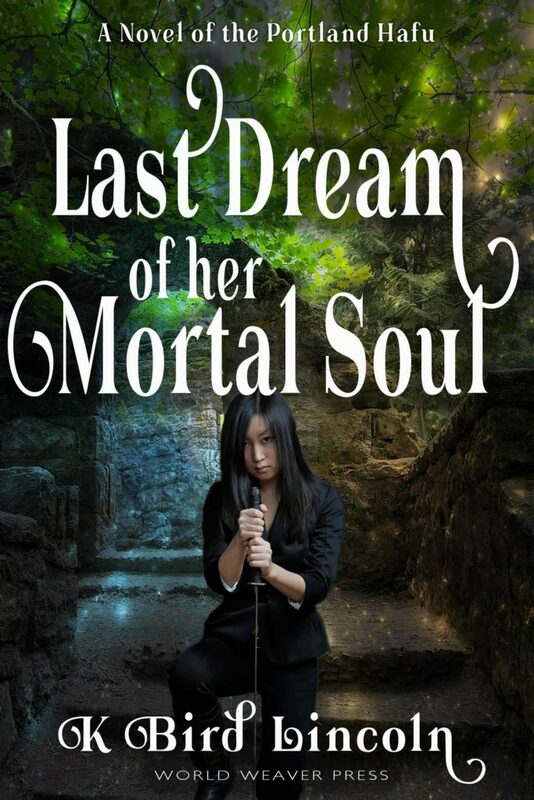 The Portland Hafu Urban Fantasy Trilogy, isn’t either of my favorite two romance tropes, oddly. I guess Kirsten-the-reader is a bit different from Kirsten-the-writer. Maybe that’s a common thing? I know that I enjoy romance tropes and unreliable narrators that are created by other authors more when they are characters I never could have imagined on my own. That probably explains it. Anyway, Ken, introduced in the first book, Dream Eater, is more of a beta hero. He is a shifter, but not an alpha-male werewolf shifter. He definitely takes a back seat to the heroine who is more powerful than Ken, despite his greater experience of the Kind—the creatures from myth and legend the heroine gets herself tangled up with. Beta heroes are kind of growing on me. I think they’re more difficult to pull off well. Although I am TOTALLY enjoying two beta heroes in two shows I’m binging on Netflix right now: Ben Wyatt from Parks and Rec because he’s genre nerdy, but not afraid to tell Leslie his feelings, and will sacrifice his own interests (job) for his love. And also the tortured Ash Tyler from Star Trek Discovery. I can’t really talk about the incredible characterization of this Starfleet pilot rescued from Klingon torture at length without risk of some major, excellent, mind-blowing spoilers. He somehow pulls off this amazing hero who has to veer wildly between alpha action hero, survivor of torture, tender lover, and wildly emotional desperation veering on abuse. In the end, I guess I’m a Romance aficionado who enjoys powerful women characters with agency the most. I still love Ilona Andrews’ Kate Daniels Urban Fantasy series, and her fellow is the most powerful Lion Shifter in their world, but I think I enjoy it so much because Kate herself is even more powerful. Whether frenemies-to-lovers, or forbidden love, it’s the female heroine through which I experience the world, so she better be awesome. Japan lost World War II, but the Tokyo Council still rules the magical Kind with an iron will. When the Council’s enforcer, Bringer-of-Death, receives orders to go after a veteran who happens to be a Baku—dream eater— he is caught between the threat of punishment and his desire to help the Baku escape. Can Bringer-of-Death find a way to both protect his family and the Baku? Or will he be trapped as the Council’s slave forever? 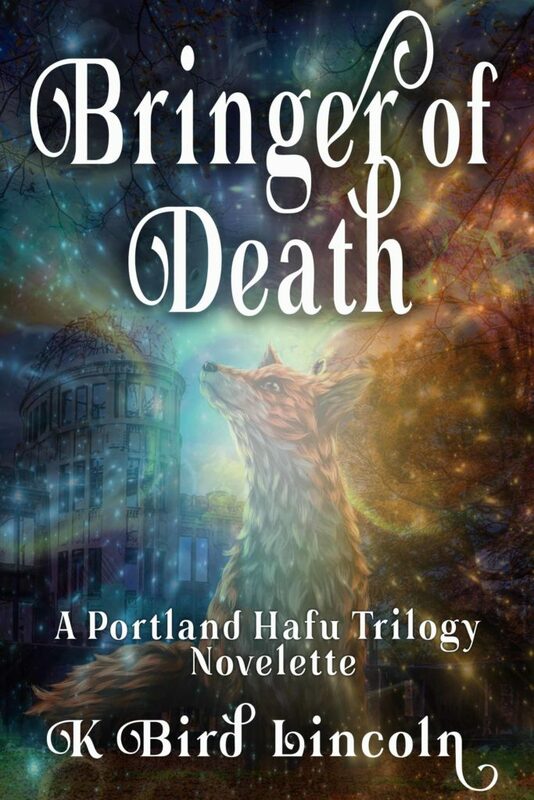 Download this novelette, Bringer-of-Death, to experience Fujiwara Ken’s very first meeting with the Baku Herai Akihito— way before he encounters Akihito’s daughter, Koi Pierce, at the start of Dream Eater, the first book of K. Bird Lincoln’s multi-cultural Portland Hafu Urban Fantasy Trilogy. K. Bird Lincoln is an ESL professional and writer living on the windswept Minnesota Prairie with family and a huge addiction to frou-frou coffee. Also dark chocolate– without which, the world is a howling void. Originally from Cleveland, she has spent more years living on the edges of the Pacific Ocean than in the Midwest. Her speculative short stories are published in various online & paper publications such as Strange Horizons. Her medieval Japanese fantasy series, Tiger Lily, is available from Amazon. 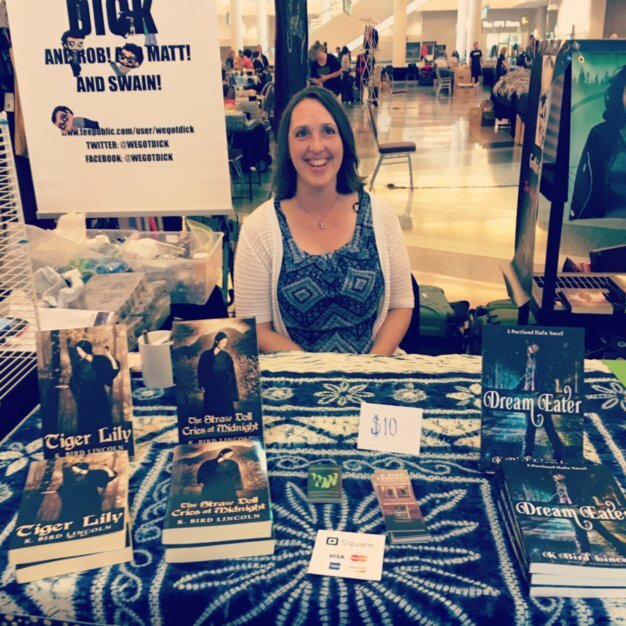 World Weaver Press released Dream Eater, the first novel in an exciting, multi-cultural Urban Fantasy trilogy set in Portland and Japan, in 2017. She also writes tasty speculative fiction reviews on Amazonand Goodreads. Check her out on Facebook, join her newsletter for chocolate and free stories, or stalk her online at her What I Should Have Said blog. Welcomed the dive into a blood connected mind! Kaboom!